Pierce potatoes with a fork or knife. Put on microwaveable plate, cover, and microwave for 6 minutes. 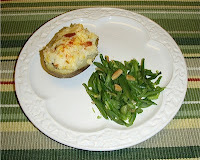 Turn potatoes over and microwave 3 or 4 more minutes or until potatoes are tender when poked with a fork or knife. Cut potatoes in half, lengthwise, making 8 total halves. Cool slightly. Cook bacon until crisp. Break up bacon into little pieces and set aside. Scoop out potatoes, leaving 1/8 to 1/4 inch thick wall (so the potato doesn't collapse). Mash the scooped potatoes with butter and milk. Add sour cream, cheese, and bacon and mix until well combined. 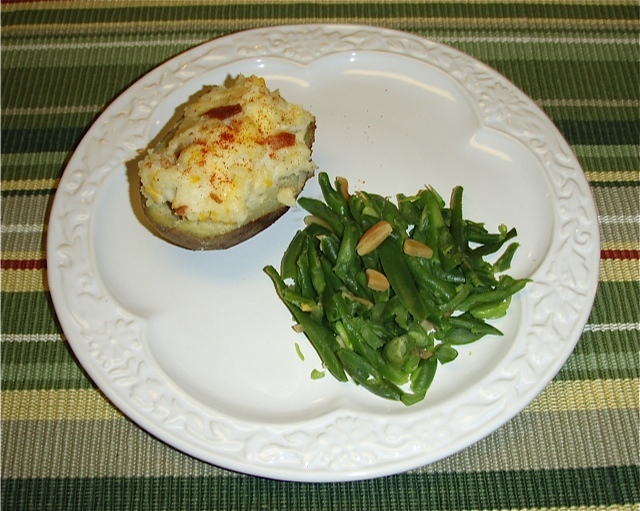 Place potato shells in oven-safe baking dish. Scoop filling back into the potato shells and bake potatoes at 350 degrees for 15 minutes. Season to taste and enjoy. If you'd like a printer-friendly version of this recipe, Click Here. HELPFUL IDEA: This wonderful recipe goes very well with Target's Market Pantry brand Lemon Pepper Chicken Wings. I buy these in the frozen foods' section in a bag. They are one of my family's favorite things to eat and are only 2 points for 3 wings. A terrific idea for those who like easy ideas that require very little cooking time.